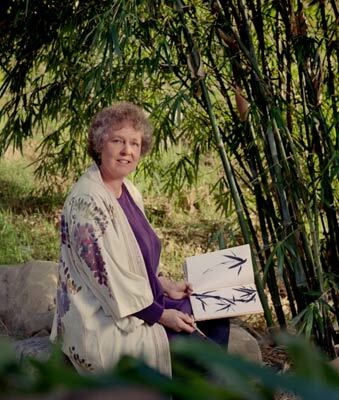 Nancy Rupp (1943 – 2001) was a widely exhibited brush painter known for the bold ink work that underlies traditional Chinese brush painting. She captured the energy and emotion of her subject through strong control of her brush. Her work avoided busy detail through soft washes of color. She would often comment how she was continually fascinated by the simplicity and vitality of ink on rice paper. Some of Rupp’s later works often explored the “po mo” or thrown ink techniques, interpreting and controlling ostensibly random applications of ink and layered watercolors on tissue-thin chien paper. Rupp’s work was part of a major group exhibition in the Newark Museum at Rutgers University, which then traveled to Taipei, Taiwan. Chinese, Japanese and Korean peers lauded her calligraphy work, inviting her to nine international exhibitions. Her Western heritage did not inhibit her from studying Asian culture. She had a Zen quality that transferred to her work. For example, if she felt strong and powerful like a horse, she would paint a horse with energy and movement, with a minimum of brush strokes. Always willing to engage the community, Rupp took on an unprecedented third term as the president of the Ojai Studio Artists – a group of renowned artists who open their studios each fall to raise money for art scholarships. She was both a leader and a team player, always willing to give of herself for the greater good. Her kind, gentle and compassionate spirit will live on in all who knew her. Nancy Rupp’s documentation took place in 2000. The FOTM Archive contains extensive information about this artist.